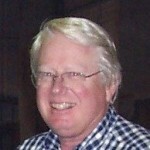 “America is experiencing a housing shortage. According to a recent report by the real estate research company Trulia.com, affordable homes priced in the lower-third of markets across the country are rapidly disappearing, with the West and South seeing the largest drops. Portland, Oregon is on the list of the hardest hit markets. With a startling decrease of 71% since 2012, Portland’s inventory of starter homes has dropped from 2,526 in 2012 to 732 in the first quarter of 2016. 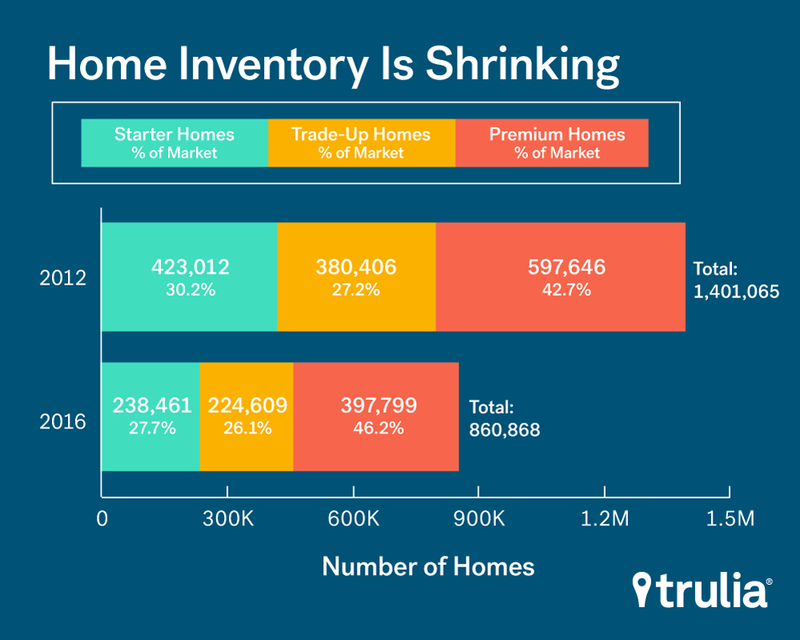 Shrinking inventory across the board, but the percentage of starter homes is shrinking the most. 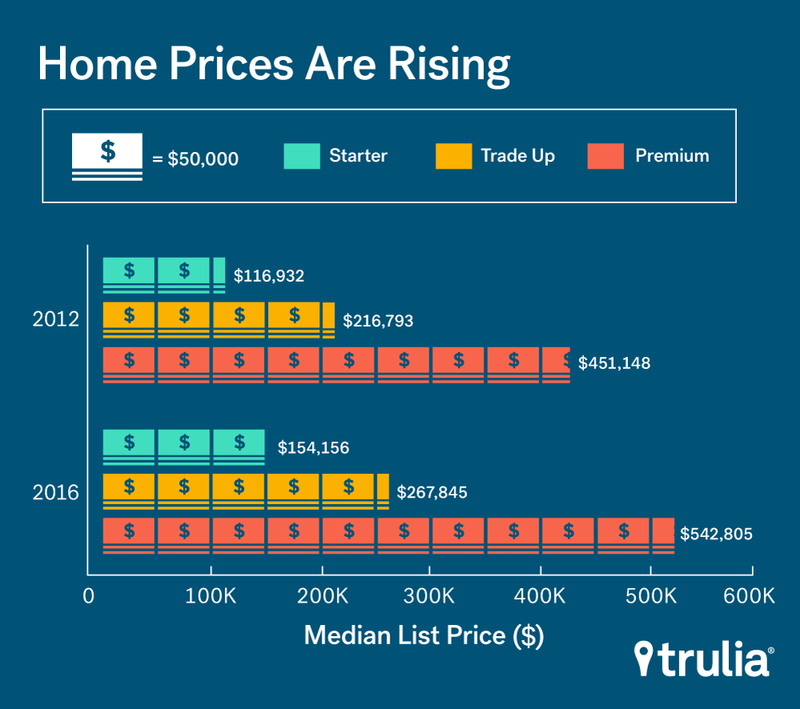 Ralph McLaughlin, chief economist with Trulia.com, explains that even though there was a gain in income over the four years between 2012 and 2016, housing prices accelerated faster than median income (in 95 of the top 100 markets). 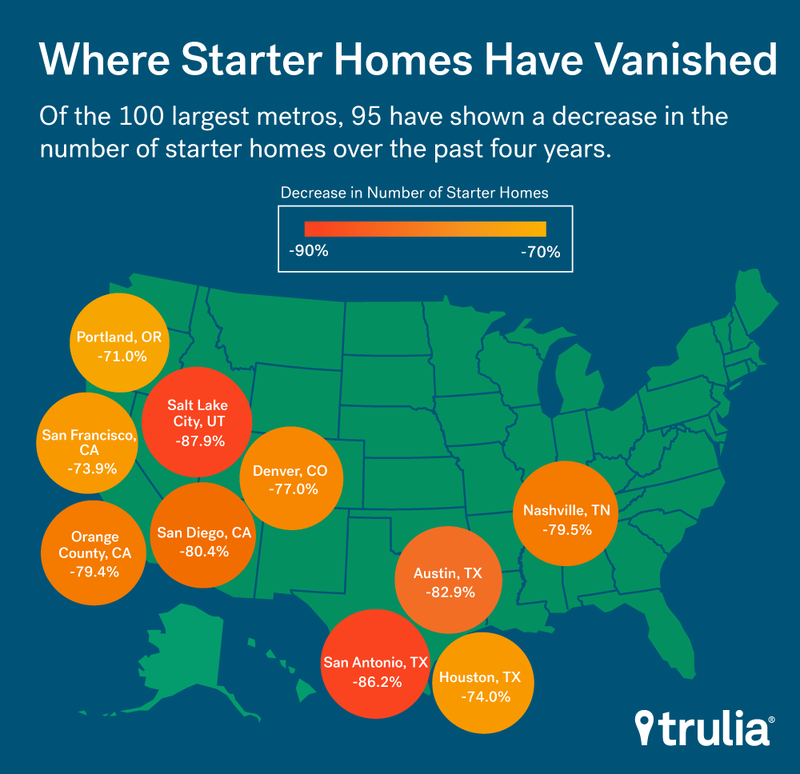 Why are Starter Homes in Short Supply? Investors bought many of the foreclosed homes during the recession and turned them into rentals. A larger share of lower-priced homes are still underwater compared to premium homes, which means that these homeowners are unlikely to sell and take a loss. Is this a sign of another housing bubble? Could a tight market and rapidly rising housing prices lead to another housing bubble, in which many buyers, desperate to enter the market, pay more for their home than it’s actually worth? Experts disagree on whether we are in a housing bubble or not, but a tight market which pushes home buyers into dedicating ever larger percentages of their income to housing could be interpreted as an alarming indicator of more foreclosures on the horizon. Do you live where homes are basically unaffordable for young families? Starter Homes are in Short Supply in Eugene, Oregon as well. The Eugene Oregon market matches the Portland. However the Trulia study only focused on cities greater than a million people . Areas in the US where affordable housing inventory is its lowest. Take in account the student loan debt, which by the way is now nearing 1.4 Trillion dollars in America, and that most graduates are leaving college and going back home to live with their parents, or moving in with other adults to save money and payoff their student loans, and that the starter home is hugely unaffordable in parts of the country, why is the starter home unaffordable? Who is causing this? Why not build more affordable houses? Look for the answer in the next blog.